Enjoy a range of interesting solar system moon facts. Learn about the variety of moons that orbit around planets such as Mars, Jupiter, Saturn and Neptune. What makes moons like Titan, Io, Europa, Ganymede, Callisto, Triton, Charon, Phobos and Deimos unique? Read on and find out! While we usually think of the Earth’s Moon there are many other moons in the Solar System. As of 2009, there were 336 moons in the Solar System. 168 of these orbit planets, 6 orbit dwarf planets, while the rest orbit asteroids and other Solar System objects (many yet to be classified). Jupiter’s four main moons are named the Galilean moons (after Galileo Galilei). Their names are Io, Europa, Ganymede and Callisto. Io features over 400 active volcanoes. Some scientists believe that water could exist below the surface of Europa. Ganymede is the largest moon in the Solar System. 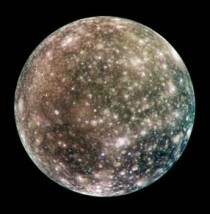 Callisto has a similar diameter to the planet Mercury but only one third of its mass. Saturn’s largest moon is named Titan, it is the only moon known to have a dense atmosphere. Neptune’s largest moon, Triton, is similar in size to Earth’s moon. Discovered in 1846 it is the seventh largest moon in the Solar System. The largest moon of the dwarf planet Pluto is named Charon, it was discovered in 1978 and has a diameter that is around half as wide as Pluto’s. Mars has two moons named Phobos and Deimos, both were discovered in 1877. Venus and Mercury have no moons.